Jollifrogs is a gift boutique for all things family in Nashville, TN, located in the heart of Bellevue at the Shoppes on the Harpeth. We have made it our mission to provide a unique and whimsical collection of gifts for babies, toddlers, young children, moms, and families. We’re confident you’ll find the perfect gift for your loved one, whether you’re shopping for an expectant or new mommy, a newborn baby, the children in your life, your friends or even yourself! Jollifrogs recognizes the innate creativity in all of us and wants to celebrate that every day! We are proud supporters of independent artisans, local crafters, entrepreneurs, and small businesses near and far. We can’t wait to meet you and help you find something truly special for your family and friends! 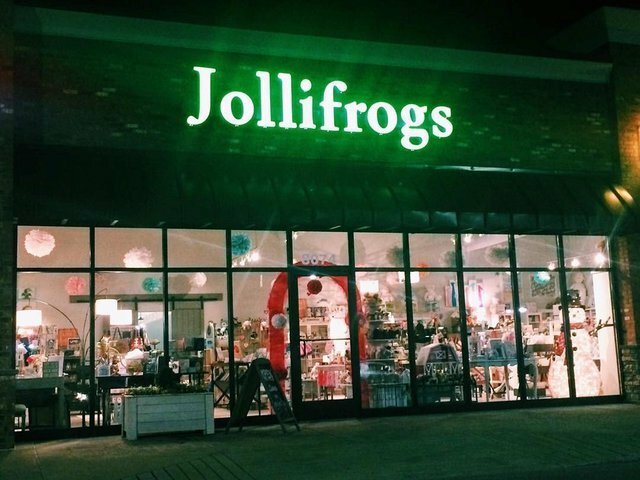 Our goal at Jollifrogs is to help make your shopping experience a fun one! Upon entering our space we hope you will feel a sense of wonder, maybe even a bit of magic, as you browse around our selection of unique gift items. We have designed our shop with cool gray tones, rustic barn wood accents, 20 ft open ceiling, and big, vintage statement pieces. We hope this ambiance will make you feel right at home so that you can relax and find that special something you’re looking for. You are an artist and your story matters. We want to bring a smile to your face and share a laugh. Jollifrogs is so excited to be a part of the Bellevue community!! Come see us!